Founded in 1913 by Thomas O. Sopwith, The Sopwith Aviation Company produced the 1 1/2 Strutter in 1915, the Pup in 1916 and the Camel in 1917. In April of 1917, the Air Board drew up a series of specifications for new aircraft types, with the first being Type A1(a) calling for a single-seat tractor fighter capable of a speed of not less than 135 mph at 15,000 ft. and the ability to climb from 10,000 to 20,000 ft. in no more than 10 minutes. Other requirements included two fixed and synchronized machine guns firing through the propeller with a 750 round capacity as well as an optional third gun to be mounted in a way which would allow it to pivot to fire upwards with 250 rounds. An Aldis optical sight, oxygen system, and an armor shield behind the pilot were also specified. The Type A1(a) would be the next generation of fighter which would replace the Camel and Se-5a. 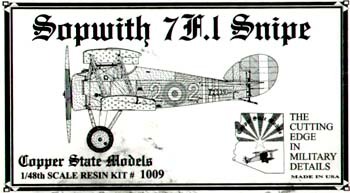 In the summer of 1917, the Sopwith company designed a fighter nicknamed the Snipe which showed no signs of being designed to meet the requirements of the Type A1(a) spec. Basically, it was a slightly upgraded Camel with better visibility. Six prototypes were ordered, which underwent several design changes during construction. However before they were completed a second set of specs were issued by the Air Board in Jan 1918. This was for a Type I Single-seat fighter, (high altitude) which was the category in which the Snipe was being considered for. Flight tests of the first prototypes also proved disappointing, with the Snipe not even approaching the required performance for the Type A1(a) spec. Despite warnings from Wing Cmdr Alec Ogilvie that, "its flying qualities are bad", and "This machine as it stands is quite unsuitable for adaptation as a type", Generals Trenchard and Brooke-Popham supported the production of the new Snipe. Thus, the first orders were placed for the new type. The first unit to be equipped with Snipes was 43 Squadron RAF in the Summer of 1918, which made its first Snipe patrol on Sept.23 1918. Its main claim to fame took place on Oct. 27, 1918, when Major William Barker shot down four Fokker D-VII's, which earned him a well deserved Victoria Cross. Aside from that, the Snipe had few opportunities for glory due to the Armistice. Snipes soldiered on in RAF service until 1926 and the type saw service in Brazil and the Soviet Union. 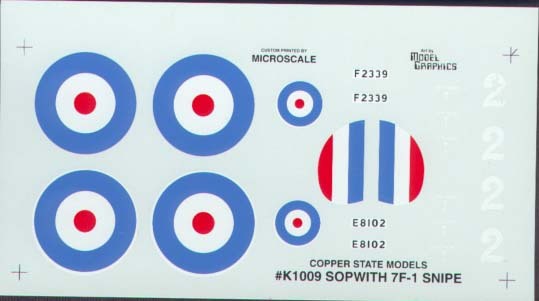 A total of 1567 Sopwith Snipes were built. Resin: Two fuselage halves (hollow), lower wing panels (two), top wing panels (two) top wing center section, optional ailerons for top wing (these are the oversized ones) horizontal stabilizer. 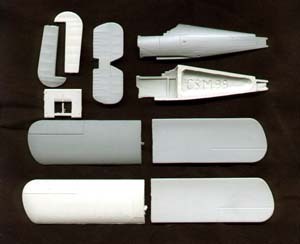 White metal bits: Rudder/fin (two different styles), engine, engine cowl, MG cowl, firewall, instrument panel, wheels, Vickers guns (two), seat, tail skid, horn, prop, nose piece, landing gear spreader bar, all struts (mains, cabanes, landing gear). 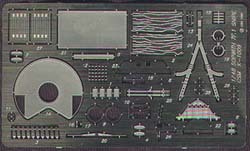 Photo-etched bits: Wing access covers (four), wing walkways (two), control horns (10), cowl panels (two), LG strap, pilot handhold plate, oil tank access covers (two), access cover (two), carb intake plates (two), discharge chute plates (two), pilot step plates (two), control wire grommets (25), pitot tube, firewall (nice), cowl latches (four), engine controls, joystick grip, rudder bar, gas tank, seat (well executed), instrument panel, shoulder and lap harness, throttle quadrant, machine gun cooling jackets, sites, and front pieces for the two Vickers guns. (I count 70 pieces). 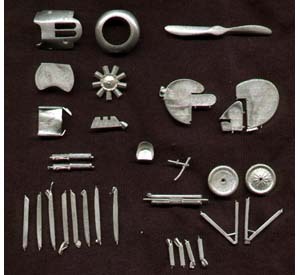 Then there's a set of British instruments (11 pieces + faces), and a few pe bits with the engine as well. Four pages of scale drawings(very nice), build notes, parts list, and a brief history. This looks to be a really nice kit. I gave the resin parts a real thorough scrutinizing and found maybe three or four little pin holes that shouldn't be there, as opposed to the holes for the control wires which are supposed to be there. Flash is almost non-existent, but the TE's will need a bit sanding down to get that nice sharp edge. Stringer and rib detail is subtle. All the PE looks great, except for the wing walks, which, I'm guessing, have an attempt at wood grain etched into them. I would have left the grain off. But aside from that, I like all the pe. The decals are printed by Microscale, and the register is dead on. What I really like in this kit are the scale drawings, penned by M.Digmeyer. One sheet for color and markings, two sheets for the GA's, showing both sides of the fuselage, cross sections, and a diagram of the basic fuselage structure. 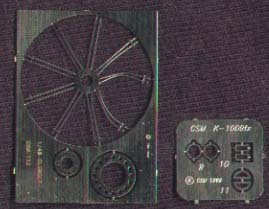 Then a fourth sheet showing engine detail and the cockpit arrangement. It looks like it will be a nice build. CSM provides most everything needed, but there's still room for the super detailers to add some more detail in the office. The only thing its really missing (imho) is the intake pipes for the engine. But I've got a supply of brass rod and a pair of pliers. I'll make do. All in all, this looks like it will build into a very nice representation of this late, Great War fighter. I would like to thank Mr. Steven Perry for editorial assistance with the history portion, and Cameron Riley for the scans of the kit.